Do you want to boost your page views? Do you want to generate more social media shares? Did you know that tweets with images get more attention and receive 150% more retweets that those without? Did you know that 87% of most shared posts from Facebook pages Worldwide are photos? Did you know that content that includes an image boosts engagement by 47%? These stats just prove that people enjoy content with images much better especially those with pretty and appealing visuals. Remember, our brains are wired to understand information with visuals much quicker than pure text. So the best way to double up your traffic? Encourage your readers to share your content by including social-media-ready images on your blog posts. And always include images on your social media posts. Now that we’ve proven that content with images perform much better. It’s time to spice up your content with appealing visuals! Here’s a new pack containing 210 easy-to-edit image templates you can use for your blog posts and social media posts. 210 templates in PNG format. Available in 3 different sizes. Ready made for Facebook, Twitter, Google+, Pinterest, Instagram and Etsy Listings. Sizes are: 1000 X 1000, 1280 x 720, 735 x 1102. 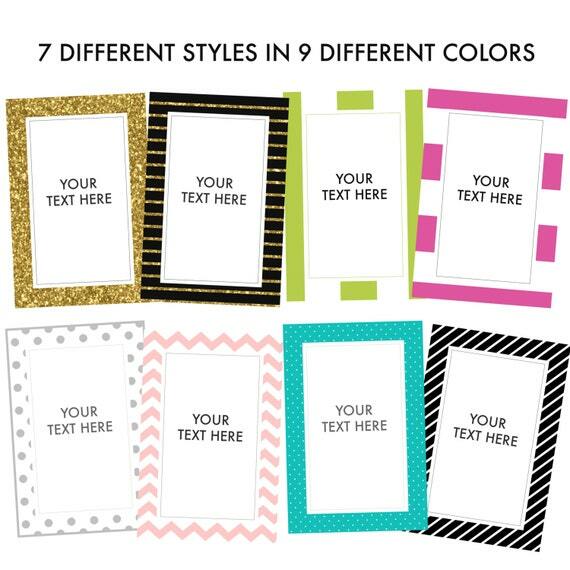 There are 8 different styles available in 9 colors (except the glittered one) – scroll down for more details! Can be easily edited using Photoshop, Paint or any other editing softwares. Save tons of time. All is ready for you. The design, the sizes, the style. All you have to do is open up any image editor and add your text! Boost social media shares. Having pretty social-media-ready images on your blog encourages your visitors to share your content. Double up your traffic. The more social media shares, the more your content spreads, the more traffic you get. 1. These are some ideas where you can use these for. I know I need a media kit but just haven’t done one. Your designs are fun, professional and beautiful. Soon as I get my page together, I’ll be back for one. You are so creative! I love so many of those. Certain colors are just so eye catching I think. These are lovely templates. I love the cute factor but that they’re still punchy. Great! These are really great templates. They are bright and colorful and I love that they come in different sizes! You always have such great printables. I think a lot of bloggers will get a lot of use from these. Thanks for sharing. These templates are simply beautiful. They say first impressions last, so you really need to give your template careful attention. Those would really make your posts more colorful! Thanks for sharing the templates with us. These are very pretty, I will have to share this with my friend, it looks like her type of style for blogging. These are awesome! I love pre-made templates, save so much time and for me creatively because i really don’t have any! Images these days should always be considered. A blog post ain’t complete without them. The prettier the images are, the better. 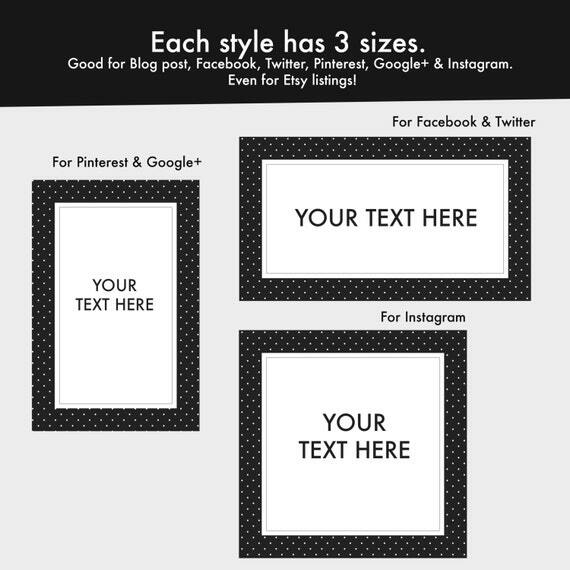 These image templates would be very helpful, especially for bloggers. They can do so much with it. These are really beautiful. This will also decrease the amount of time someone needs to make their own. Thanks for sharing this with us. These are such nice designs! I didn’t realize how important nice images were to making your content shareable. Thank you for explaining why to have the pretty image templates! I really had no idea, and now that I know I can do something to pretty up my blog even more! These are very awesome and chic! I bet they would really enhance the look of images and really make them look more professional! These are great and yes, being a visual person, I am way more likely to engage on a post with an image. This is absolutely adorable, I have to get a few for my site to liven things up around here. I love these templates. You’re right about images, it’s so important to use images that are social media friendly. It makes a world of a difference. What absolutely lovely templates! I’m going to add this to my list of “must buys.” I don’t have time to always create the perfect graphic so this would help immensely! Those are really pretty templates. I love a lot of these, I will have to check them out. Didn’t know those stats. Such lovely templates you got here – so neat and colorful. I love the one with the polka dots most of all. Thank you for these. These are very nice templates. I need to make the investment soon. I love Twitter and need to utilize it better. Thank you for the tip. These templates are so pretty! What a great way to add some color to a regular post! Love the pink chevron one! Really cute templates. I’m a Graphic Designer, but sometimes I get lazy and sometimes other people have prettier images, so I like using them!! This is a great resource to have on hand, especially if you are just starting up and don’t want to blow your budget out of the water. These are the things that I don’t have the ability to do, I have no technical skills. I always hire someone to design my blogs. These are great templates to use. I will have to remember these for my blog. I have already been using your media kit with great results. I will be ordering these templates as I am sure they will help me increase my blog traffic. Thank you for sharing. I actually promised a friend just this week that after a year of working wth brands I need to create a media kit. Although this far I’ve never needed one but would love to get more sponsored opportunities. I’ve already pinned your business as a reference , love the templates. Great looking templates. I enjoyed reading the facts about how much of a difference adding an image to your social media posts can make. I’ve been trying to do that more often with my Tweets. This is so very helpful. I have two blogs and can use a lot of this info. These are super nice templates! I loe the polka dotted one. Thanks for sharing! Those are some very cute Templates. Thank you for sharing.